This is the talk given by Alex and Chloe on the 3rd Nov 2018. The views expressed within this talk are personal and not reflective of the views of other members of the Edinburgh Association of Spiritualists, or indeed The Spiritualists National Union (SNU). Spiritualism as a religion has only seven principles and that allows each of its members the space to explore what spiritualism means to them. Bear this in mind as you read these talks that these are our current beliefs but in years to come we will most certainly have adjusted these beliefs or even outgrown them completely. That is why we are spiritualists – ‘Eternal progress Open to every Human Soul’. Alex – “Beyond this world, our solar system opens out into a vast universe. Beyond that universe there are endless other universes, that stretch from ours to the end of space and time. Beyond that is the potential for all creation, the Source of ‘All that Is’. This source creates all the systems that we can see and all the ones that are invisible to us. Source, in its desire to experience, creates limitless realms for exploration and growth. And in one of those creations we chose to experience it and relay our experiences of it back to Source. The system that we exist in is a sense based one but what we experience is not real. It is merely vibration, energy pulsing to the beat of one drum. We are dancers in a grand cosmic ballet, players on a shimmering stage of illusion. This world that we imagine to be so real is just an impressionist painting created by an organic brains interpretations of the vibrational signals, that are produced by our five senses. If we are living in this world of illusion then our spirit brothers and sister must exist in the real world. In the spirit lands you can build a paradise without moving, you can cross time and space in an instant but you are never separate from the Source, or from each other. In our world spirit we can experience what it is like to not share our thoughts with everyone. In our world each person can be unique. Free to make their own decisions. Free to become one with the silence of your own inner life. We have freedom to make mistakes. Freedom to grow, to experience your own personal responsibility. As spirits we pushed hard for the opportunity to come here and experience privacy, but somewhere along our path we forgot why we chose to be in this world of flesh. Somewhere along the way we found this dark silent space sitting within ourselves, and we mistook it for lack, a hole that needed to be filled. In our ignorance we seek out others, we sell our souls, our inner life, our innate uniqueness for a handful of magic beans. We will try anything to fill that gapping hole within us. Years later we realise that the beans have no real value, that the beanstalk we have been feeding does not lead to a pot of Gold. It is in this moment that we appreciate what we have always had. We embrace that silent void inside us. We discover that this silence pulses with the energy of one heart. This silence nurtures us, it loves and provides for our every need – if only we will let it. And this is the reason we are here. The ultimate freedom of being the sole creator of our own reality. If this universe is mine, created by me then I must contain a vibration. And this vibration, although synchronised to the beat of the cosmic drum, is unique enough to be recognised as me and me alone. It is essentially the same note as yours but the tone is different. I have a different skin on my drum than you have. The beliefs that I hold apply tension to that skin of my drum in such a way that it makes my beat unique. And the thump of my drum crosses the universe, transcends time and space, to pull events from the potential energy of ‘All that Is’. My unique vibration draws these life events to me, like drawing pins being attracted to a magnet. Everything in this world has its counterpart in the spirit world. I’m referring to the phrase ‘As above, so below’. Information passes from one world to the next with no discernible time difference. We wonder how entangled particles can vibrate together when they are thousands of miles apart but as both particles are already connected, within the spirit realm, then time does not apply to them. 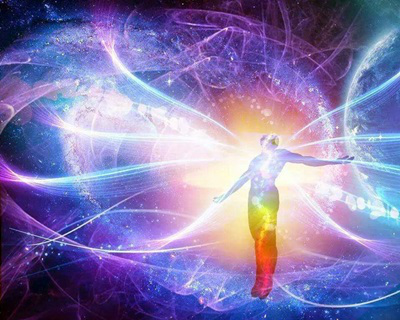 Every cell in your body connects with another in spirit and they share an energy charge between them. As one increases the other decreases. This is how equilibrium is maintained. After all energy cannot be lost, only transferred. These cells have magnetic attraction but also a resistance to each other. In this dance of positive and negative a balance is struck that allows your body to not fly apart. There is no force applied in this process, just a mutual respect, a give and take that crosses all of the boundaries whilst existing in a model that allows for all possibility. To be, and to grow – this is our purpose and that purpose finds its truest form in cooperation, free movement of energy, and variety. This positive/negative magnetism can be found throughout life. Even the planet has it’s poles and a field of energy surrounding that axis. Your physical body has a similar axis running through the spine and a field of energy surrounding it. It is your unique axis that draws events from the quantum field of potential into your physical time and space. These events vibrate so fast that initially we are only aware of their presence in our higher bodies, bodies that vibrate in a similar event wavelength. As these events slow down they move from spiritual to mental to emotional and finally they manifest into your physical reality. They do this so that free will still applies. As these events slow down you sense their arrival and can decide whether you want them to materialise or not. Spirit creates the events, they appear in our dreams where we can try them on for size. When they are close they start to tug on our emotions. We start to feel them before we ever see them. We sense them as intuition, hunches, gut feelings. And if we have decided that this event is for us it will eventually materialise in front of us. There are no accidents in conscious living. As Einstein said ‘God does not play dice’. The closer you are the more chaotic it all seems but the further you can distance yourself, the more you realise just how perfect it all is. How balanced it all is. And from a greater distance you can marvel at how perfect that balance has to be for this beautiful planet to support so many forms of life. And your role on this planet is the expression of your free will, your freedom to express your private thoughts using symbols – Speech, writing, art, music. Each of us is unique but it is how we share our journey with others that truly defines us. I went to bed after writing the last section and decided to allow Spirit to work out the direction of the next part of the talk. The next day I am driving to work and a delivery lorry is blocking my view of the road ahead. Then I realise how poignant the signs on the back of the lorry are. These were signs that a year ago I would have read and just ignored. Now, after a year of trying to actively live a conscious awareness, I am being drawn to them. It feels like each word is written specifically for my benefit, as if crafted by some unseen spirit hand. My eyes and ears are now regularly distracted by peripheral movements, designed to make me notice my next message. There is a pattern now, a design that has replaced what was once either banal, or simply chaotic. Chloe and I had been talking for several weeks about how people come into our awareness for a reason, and that reason is usually to mirror a situation that is going on inside ourselves. If I am angry then an angry person will be placed in my path and they won’t move until I deal with my anger. It was never about them or their anger. I have to stop, become aware of them, understand what it is they are teaching me (about me), deal with it then move on to the next belief. 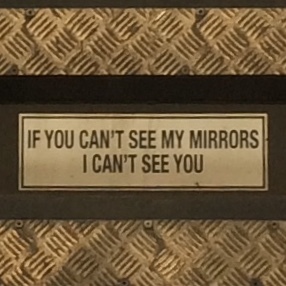 “If you can’t see my mirrors, I can’t see you”. That was the sign on the lorry that got stuck behind. I translated that as, ‘If I can’t see my triggers then I must be doing something right inside’. The second sign said “Beware of passing this vehicle on the inside”. That to me is saying you might be able to fool me on the outside but if you are trying to trick my higher self then you are going to have a harder time. My unconscious awareness is wise to you today and my conscious awareness will come alive to it tomorrow. So, when the lorry appeared that morning, I just thanked Spirit for giving me those signs, for all those little synchronicities, for allowing me to be once more ‘within the flow’ of my divine purpose. And at that point, while I am stuck behind that lorry, I realised that I am in a state of gratitude. I catch myself smiling in the mirror. I am actually smiling and if you know me then you know this is a rare occurrence. See, when you are in a state of gratitude you start to vibrate at a higher level, and when you vibrate at a higher level you start to see those events, that I mentioned earlier. You start to see them appear way before they have actually manifested into physical reality. You make better and more conscious decisions, based on knowing these events are about to arrive, that they were always meant for you. Your life just gets better day by day. By meditating on a daily basis you become acquainted with the silence inside you. And as you practise, these events start to appear more often, and quicker. 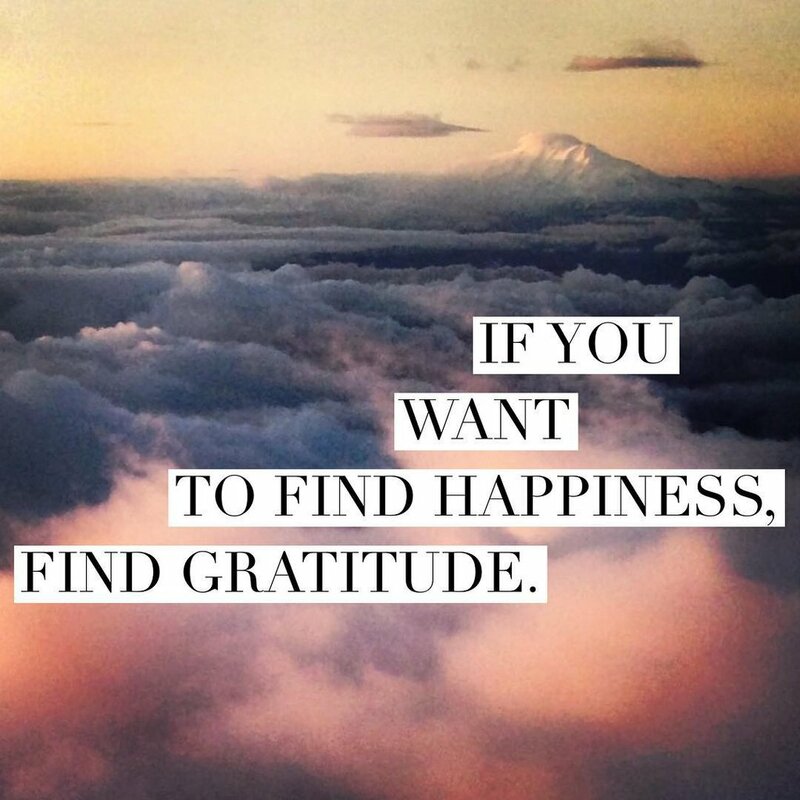 You have less time to be in a state of ‘I’m not grateful’ and gratitude becomes a daily gift. Imagine if you ever reached a state of always being grateful, your world is going to start rocking. CHLOE – “Alex and I took conscious living as our starting point. Why? Because personal responsibility, to us, involves being conscious, aware of ourselves, our thoughts, feelings, habits, perceptions and actions. After all, that’s what personal responsibility means? Alex’s ideas and mine are very different, but in places they intersect, do a wee dance of unity before heading off on separate tracks. 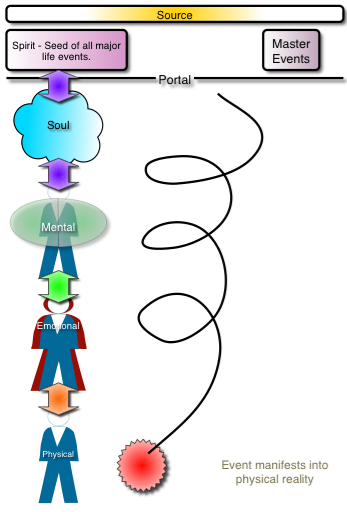 We were both inspired by Spirit to do this – albeit in very different ways – Alex just knows he is connected, goes off and writes his talk in a few easy steps. I, on the other hand, had to have several crises of confidence before surrendering to Spirit, who then utilised all the material in my subconscious – all the books they had inspired me to read, conversations had, personal experiences along the way that coalesced into the material for this talk. What’s not my personal responsibility is important as well. It’s not my job to judge others thoughts, feelings, beliefs, perceptions or actions. Being responsible for ourselves is a big enough task without adding others into the mix. Being responsible for self means being aware of the choices I make on a daily basis, as their effects ripple far beyond my conscious intent, and their ramifications may not be available to me at all in this lifetime. 95% of our mind’s activities operate below our conscious awareness. It’s busy ensuring that millions of chemical reactions in our bodies take place, that ensure our health. It does a dizzying array of things that we are unaware of, until consciously considered – like breathing. Now I’ve drawn your attention to the fact you’re breathing, it just becomes annoying! This 95% of our mind actually runs us most of the time. As children, we learned how to behave within the context of families, peers, teachers, and much of this learning is stored in the unconscious regions of our mind. These beliefs that we inherited from our families – about whether the Universe is friendly place or a scary place, and a whole host of attitudes, opinions, including our own beliefs in self-worth, are largely picked up, learned responses that we remain unaware of. These programmed behaviours are there when we as supposedly conscious beings are in ‘default mode’ – we’re off fantasising about the future, ruminating over the past, etc which is a frightening amount of time! None of our attention is in the present moment and is instead tied in old, very familiar patterns of thinking. The thoughts we think on a daily basis, if we care to observe them, are largely negative, self-critical thoughts and the exact same thoughts we had yesterday. Our self-critic isn’t even creatively abusive! This is NOT conscious living. This is a kind of narrow, focussed attention on objects, people, places, things and problems, in our known reality. It requires very little effort and is a kind of reflexive reaction. There is no clear direction, purpose or clarity, leaving no room for our attention, intention or for spiritual growth. So our first job is to start paying attention to the thoughts we think, recognise that the ‘inner critic’ that bullies us into submission is not objectively ‘real’ and is simply an outdated programme in our mind whose volume needs to be permanently muted! These early experiences in our lives shape our responses to life, and because they have been largely running in the background, we have been unaware of their pernicious influence over our self esteem and experiences in life. It takes a bit of self-compassion to really observe our personal beliefs – about ourselves and the world around us; to be honest about whether these beliefs/habits/attitudes of mind, are meeting our needs. Armed with a little biology and psychology we understand that many of our habits are adaptive responses that our ancestors needed in order to survive in their physically dangerous environment. Hunting for food was potentially hazardous and scanning the environment for dangerous predators made sense to our ancestors. But once they saw that they were safe, their attention state changed to a less anxious, more relaxed state of awareness. In the 21st century we are a very different animal. From an early age we are primed of the dangers ‘out there’ in the world, on the look-out for scary men, cars, muggers, etc, all negative dangers which keep us in a permanent state of heightened alert. Our bodies are running hormones such as adrenaline and cortisol all the time as our fight/flight reflex is constantly stimulated – road rage, anger, depression are prevalent in our society because we were never meant to stay in this heightened state of alertness all the time. Running adrenaline in such a way is damaging to our health as it compromises our immune systems and can lead to disease, either physical or mental. All because of the type of attention we habitually attend with. Every day our brains, if left in peace, will naturally cycle through a variety of states of awareness, from high beta, alpha, 1,2,3, theta, delta and gamma brainwave states. We experience them as different kinds of paying attention. Right now I’m in high beta because I’m stressed at presenting this talk. You are more likely to be in low range beta, paying a more relaxed type of attention, I hope! Religions have always understood this and many religious practices are designed to move us into different states of awareness in order to have different experiences. In these altered states of awareness our attention may be focussed less on the outside world and more concerned with the spirit within. Throughout history, mankind has used our ability to maintain different, altered states of consciousness as a gateway – to experiencing profound mystical revelation on a very personal level. Whether by ecstatic drumming, where rhythm is used to alter our state into trance, whirling dervishes, imbibing Ayahuasca as part of a sacred ritual – the desired result is for our attention to be taken away from our bodies and onto something non-material. It allows us to access higher levels of perception and to gain a greater understanding of our lives in relation to others and to the Universe as a whole. Our body is surrounded by an energy field that extends as far as our outstretched arms and the full length of our body. It’s both an information centre and highly sensitive perceptual system. In this way our bodies are in communication with the space that surrounds us, part of the unified field that exists beyond space and time, that connects all frequency and information that connects all matter. Our personal energy field is a collective of all the different energy centres in our bodies – chakras to some, and broadcasts a totality that is our personal, unique frequency. All our past experiences, thoughts, feelings and perceptions resonate at a frequency that affect our electromagnetic signature. Every thought we have enters our systems first as an energy. Those thoughts that carry emotional, mental, psychological or spiritual energy produce biological responses that are then stored in the cellular memory of our bodies. If we can understand ourselves as being ‘energetic’ beings then we can see how our thoughts are always impacting us. Energy is power. If our attention is focussed on a past, negative experience, then we are literally transmitting our energy into the past. Our bodies can’t recognise the difference between our having an experience in the world, and our subsequent thinking about that event. To the body, it’s all the same and it responds emotionally in the same way every time. What emotions are you running in your body, repeatedly? We are constantly broadcasting who we are being to the unified field that surrounds us, and the energy signature we put out is what we receive back from the unified field, because it’s a resonant match. Where we put our attention is where we put our energy. Knowing this can help us be more conscious of where our attention is in each moment, and if it is not in the present, then our energy is unconsciously dissipating. We have to learn to manage where our attention is, what our intention in each moment is in order to become more conscious energetic beings. Managing our power of choice is the main challenge of our lives. It starts with choosing what our thoughts and attitudes will be – acknowledging that we are participants in what experience, not passive receivers. We are both matter and spirit/energy. Every choice we make, motivated by the vibration of fear or faith, directs our energy/spirit. If we choose to live in fear, negative thoughts deplete our energy systems and we retreat into non-conscious, habitual patterns of behaviour. One type of altered state of awareness allows us to connect with higher frequencies. If we decide to pay more attention to ourselves as energy beings, we can alter our consciousness so that it pays less attention to the material world. If we want to connect to this unified field, that invisible field of energy that surrounds us, an infinite field of consciousness, then we have to take our focus away from analysing/thinking, and pay attention to the space all around us. This opens our focus and slows down our brainwaves. It allows our consciousness to move out of the thinking mode and into our limbic system, where it connects with our autonomic nervous system, the body’s subconscious operating system. To communicate with our subconscious operating system we have to recognise that it has no personal awareness of itself, and to give it instructions, we have to communicate in a way it understands. It uses our body’s emotions as its language. When we think and feel loving thoughts we are sending a coherent message that the unconscious understands and responds to. Emotion is energy in motion. When we are broadcasting elevated feelings into the field around us, it responds. When we can get beyond our bodies, beyond our limited perceptions of ourselves and move our brainwave state from beta to alpha/theta, then we are vibrating at a frequency that is coherent. Our hearts have a huge electromagnetic field, and when the heart and brain are working in tandem, our personal signature, our consciousness is resonating at a frequency closer to our Higher Self. We do this by meditation. When we close our eyes and open our focus to infinite space, our attention is on energy, space, information, possibility rather than matter. This is where mediums contact Spirit, where healing originates. When we become pure consciousness, we merge with the unified field, which is also made up of consciousness and energy, It’s a self-organising intelligence that’s always observing our material world into existence. This loving intelligence is both personal and universal, within us and all around us. The more often we make connection through meditation the more it carves a new neurological pathway from our thinking brain to our autonomic nervous system (ANS). We are enriching our brain’s circuitry, accessing that previously inaccessible 95 % below our conscious awareness. In this way we are literally evolving our brain in the process of becoming aware of greater levels of consciousness. The more coherent our brain becomes, the more coherent we become. As we connect to this Loving Intelligence our experiences and knowledge change, as we are accessing greater information. We experience love, joy, bliss and freedom. We are conscious that our consciousness is far greater than our body, and that the type of attention we use affects our very reality. In this moment the energy from the unified field, in the form of emotion, flows into our energy field and reconditions our body to a new consciousness. Our brain is activated by a greater energy that carries specific information in the form of thoughts/imagery. Our brain tracks and records this profound inner event, and its intensely emotional aspect captures our mind’s attention. We experience a mystical connection that we never forget, yet find impossible to articulate, as the symbolic nature of language does not do justice to a personally experienced connection with the Divine. The more we consciously cultivate knowledge of ourselves and choose to live each moment broadcasting our light from a place of love, the better our personal relationships become. We deepen our relationship with the spirit realm and that great universal loving spirit. We become aware that, as well as individuals, we are all an integral, interconnected piece of the whole. As I mentioned earlier, the heart’s electromagnetic field is far stronger than our brain’s because our thoughts and emotions are energies that emit powerful magnetic fields. The stronger the elevated emotion, the stronger the magnetic field. The heart’s electromagnetic field is 5000 times greater in strength than the field our brain produces. When our heart moves into coherence through a sustained elevated emotion, it acts as an amplifier sending coherent information through its pathways straight to the thalamus, which synchronises both the neocortex and our brain’s survival centres. So, when we place attention on our heart it creates coherence in the brain as well. The heart is the key to a state of awareness where we have access to deep intuition and subtle memories. It’s no accident that most religions acknowledge the power of love. As conscious beings, we have the opportunity to put into practice what we have learned about ourselves, to evolve our brains and hearts, and consciously create experiences that enrich our world. Where you put your attention is where you put your energy – what do you want to broadcast into the field? The HeartMath Institute, a research institute which have been operating for about 30 years, based in Boulder Creek, California. They developed a Quick Coherence Technique which has been designed to send a signal to the body that a specific shift has been put in motion. Combined, these steps create an experience that puts us back in homeostasis, away from our conditioned responses, into a more elevated state of being. Allow your awareness to move from your mind to the centre of your chest. This sends a signal to the heart that you are no longer engaged in the world around you, but are now becoming aware of the world within you. This simple step sends the message to your body that you are safe, and slow, deep breathing stimulates our relaxation response through the parasympathetic nervous system. To the best of your ability feel care, gratitude, joy to be alive in this moment, and feel it as sincerely and as heartfelt as you can. The quality of this feeling fine-tunes and optimises coherence between heart and brain, and it’s from this state we are able to access our intuition.